Big Statues was asked to create a statue of Robert Wiley to be displayed at the Dusuenberg Museum, along with the 4 other statues Matt Glenn has created. "I have learned a lot about the personalities and the purposes that each of these individuals have held in the great success of this amazing development." 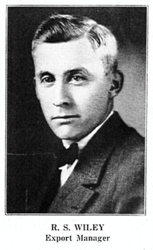 Robert S. Wiley played an important role in the development and success of the Auburn Automobile Company. He was the export manager, put in charge of one important aspect of the company, networking. He helped establish dealers in all 48 states in the U.S. and in 101 foreign countries around the world. Although the company closed its doors more than 75 years ago, the work and dedication Wiley put into the success of the business still generates business by bringing many visitors to the Auburn Cord Duesenberg Automobile Museum. Big Statues was approached by the museum to create multiple statues of individuals who played large influential roles in the growth and development of the Auburn Automobile Company and Duesenberg, Inc.. Robert S. Wiley is the 5th statue of the collection that Matt Glenn at Big Statues has designed and then brought to life through sculpture. "It's been a great opportunity to be a part of this project. I have learned a lot about the personalities and the purposes that each of these individuals have held in the great success of this amazing development." Every year over Labor Day weekend, the Auburn Cord Duesenberg Festival celebrates this automotive history. The work of Matt Glenn displays each of these historical figures - proudly standing in beautiful bronze in front of the Auburn Cord Duesenberg Automobile Museum.